It’s an Indian dessert made out of carrots. The best time to eat this is winter when the juicy red carrots are in season. Though it’s very famous dessert amongst North Indians now it enjoys popularity across India. As the winters have gone but red carrots are still seen around and Baisakhi is around the corner just jump and make this dish. 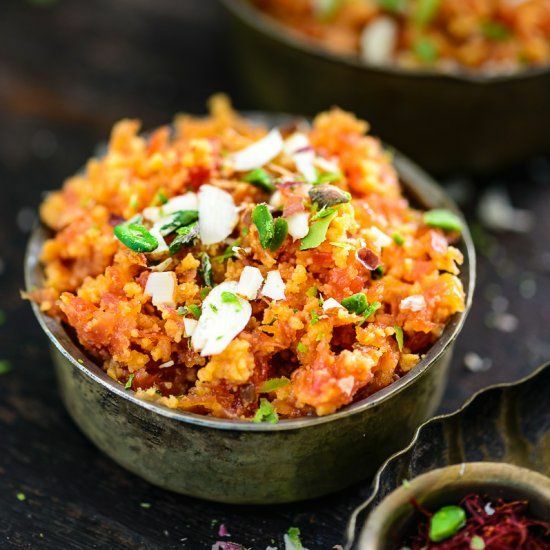 Heat ghee in a pan and then add the grated carrot and cook on medium flame for 8-10 minutes till the carrots soften and its color becomes a bit pale. This is an indication that the carrots have become soft. At this stage add the hot milk to the grated carrot and cook on medium flame for 20-25 minutes till all the milk is soaked into the carrots. Incase you are adding saffron add at this stage. Lastly add Elaichi powder and serve with chopped almonds and pistachios. You may add cashew and raisins too if you want. It is a rich dish so if you wish to make it lighter/healthier remove mawa and add 1 litre toned milk instead of full fat milk. Rest all will be same.